To ensure that every first-responder who has died in the performance of their duties is always remembered and honored by their community and agency. 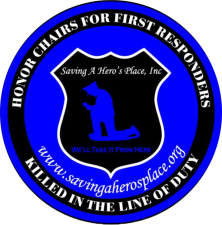 Saving A Hero’s Place is committed to honoring the memories of first-responders who have died in the performance of their duties by providing their department with a permanent place of reverence for their fallen hero: the honor chair. We promote healing and peace for public safety organizations through the remembrance of those who gave the ultimate sacrifice. We have completed 73 chairs since our inception and we currently have 50 honor chairs (and rising) being requested by local law enforcement agencies. These chairs are a memorial and a symbol of healing for a law enforcement organization. The brothers and sisters of the organization, the community, and the families of fallen heroes request these chairs from Saving A Hero's Place. Help us send a symbol of love, reverence, and comfort with your donation today.